Susannah Spurgeon was the wife of the nineteenth-century Baptist preacher C.H. Spurgeon. While much is known of her famous husband, comparatively little is known about the woman whom he adored and affectionately called, "Wifey."? Brought together in a single volume for the first time are two titles that will help to address that imbalance. Mrs. Spurgeon's A Carillon of Bells consists of twenty-four daily meditations on selected texts of Scripture. The warm spiritual devotion to her Savior that burned in the heart of this godly woman shines through on every page. The Life of Mrs. C.H. Spurgeon by Charles Ray is an affectionate love story but one that also records the fascinating work of Mrs. Spurgeon's Book Fund. Through this agency thousands of pastors and preachers received gifts of good books that proved useful to them in their ministries. It is also a story of the all-sufficient grace of God in the midst of debilitating chronic illness Susannah Spurgeon was enabled to do a truly great work for the Lord, and her inspiring example continues to bear fruit to this day in the work of the Banner of Truth Book Fund. - Publisher Susannah Spurgeon was the wife of the nineteenth-century Baptist preacher C.H. Spurgeon. While much is known of her famous husband, comparatively little is known about the woman whom he adored and affectionately called, ?Wifey.? Brought together in a single volume for the first time are two titles that will help to address that imbalance. Mrs. Spurgeon's A Carillon of Bells consists of twenty-four daily meditations on selected texts of Scripture. The warm spiritual devotion to her Savior that burned in the heart of this godly woman shines through on every page. The Life of Mrs. C.H. Spurgeon by Charles Ray is an affectionate love story but one that also records the fascinating work of Mrs. Spurgeon's Book Fund. Through this agency thousands of pastors and preachers received gifts of good books that proved useful to them in their ministries. It is also a story of the all-sufficient grace of God ? in the midst of debilitating chronic illness Susannah Spurgeon was enabled to do a truly great work for the Lord, and her inspiring example continues to bear fruit to this day in the work of the Banner of Truth Book Fund. 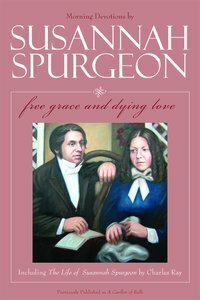 About "Free Grace and Dying Love (Susannah Spurgeon)"
Susannah Spurgeon was the wife of the nineteenth-century Baptist preacher C.H. Spurgeon. While much is known of her famous husband, comparatively little is known about the woman whom he adored and affectionately called, ?Wifey.? Brought together in a single volume for the first time are two titles that will help to address that imbalance. Mrs. Spurgeon's A Carillon of Bells consists of twenty-four daily meditations on selected texts of Scripture. The warm spiritual devotion to her Savior that burned in the heart of this godly woman shines through on every page. The Life of Mrs. C.H. Spurgeon by Charles Ray is an affectionate love story but one that also records the fascinating work of Mrs. Spurgeon's Book Fund. Through this agency thousands of pastors and preachers received gifts of good books that proved useful to them in their ministries. It is also a story of the all-sufficient grace of God ? in the midst of debilitating chronic illness Susannah Spurgeon was enabled to do a truly great work for the Lord, and her inspiring example continues to bear fruit to this day in the work of the Banner of Truth Book Fund.